Mother of the Bride, when it comes time for your daughter and her intended to think about wedding gift options, remember that different couples will have different needs and desires. Some couples will want to register for gifts at a variety of outlets while others will select only one. Some couples are setting up housekeeping for the first time while others have already acquired many belongings. Brian and Robin have already acquired much of what they need for housekeeping. It would bring them great joy if you would give a gift in their honor to the charity of your choice and then share news of it with them in a card. Is this something that might appeal to your daughter and soon-to-be son, MOB? If so, share the idea with them and see what happens. What a difference it could make for many! 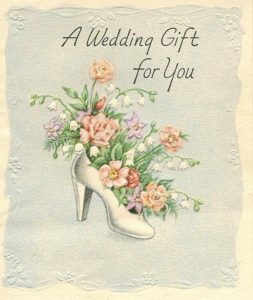 *You might also like to read Wedding Registry Roundup and Mother of the Bride—Info Source for Gift-Givers.